Flash back for a moment to 1985. The golf industry is on the rise and the real estate market in Florida is booming. As northerners reach retirement age, their mind is set upon moving to Florida and playing golf into their twilight years. All is good in the Sunshine State. Two popular resorts in Southwest Florida back in the late 1980’s were the Naples Registry – now Naples Grande Beach Resort– and the Ritz Carlton. These resorts were booming, especially during “the season,” January through April. Nearby golf courses could make it just by booking guests from these two resorts. With that in mind, the community of Pelican’s Landing was born. It all started with the building of Pelican's Nest golf course, designed by golf course architect Tom Fazio specifically to serve the needs of the nearby Ritz Carlton and Registry hotel guests. 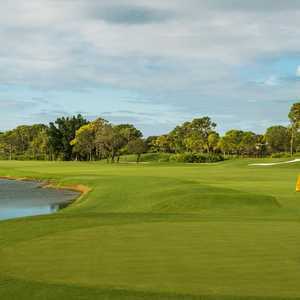 The course was an instant hit and garnered Fazio his first appearance on any of Golf Digest’s prestigious “Best of” lists; Pelican’s Nest golf course debuted at #3 in the publication’s Best US Public Courses. 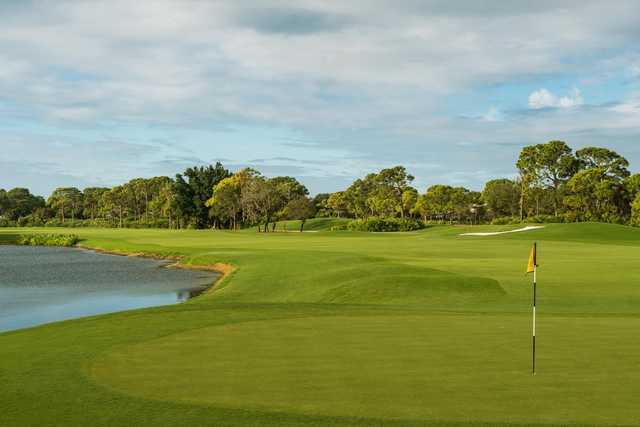 As expected, Pelican's Nest golf course grew quickly in popularity, so the developer started to purchase the surrounding land, and in 1989, Pelican’s Landing emerged as one of the premier residential golf communities in Southwest Florida. The Nest - as it is affectionately referred to by residents and members alike – features 36-holes of championship golf as well as all of the other amenities discerning members have come to expect. 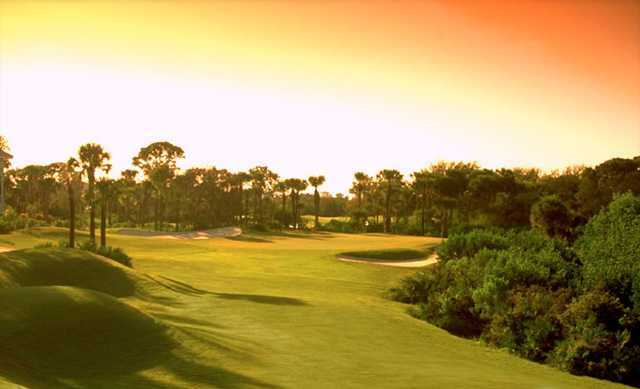 In fact, both The Hurricane Course and the Gator Course are recognized nationally as two of the finest golf facilities in Southwest Florida and come highly recommended by experts and golfing aficionados alike. The Pelican Landing community includes single-family homes, villas, coach homes, garden condominiums, mid-rise condominiums and bay-front high-rise condominiums; prices range from the $200’s to over $3 million. The last two years at The Nest have seen a lot of change, all for the good. Both golf courses have undergone complete renovations and are in the best shape ever. Fairways are plush and lush, bunkers are well manicured and contain soft, fluffy sand and the greens roll fast and true. " Both courses at Pelican’s Nest been recognized every year since 2001 by Audubon International, as a “Certified Audubon Cooperative Sanctuary” a real testament to their membership’s efforts to protect and enhance the environment. 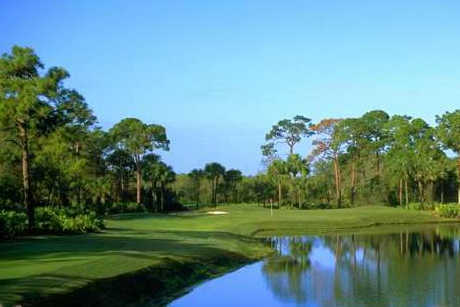 The Gator Course winds its way through protected wetland marsh areas and forests of live Florida oaks and scrub pines. Just outside the back of the clubhouse is a large practice green for putting as well as a full-length driving range where you can hit every club in the bag. A spacious short game area with bunker can be found adjacent to the 18th green on The Hurricane Course. Most Memorable Hole: Number 8: Par 4, 408 yards (Tee II). This hole is the number one handicap on the Gator layout, and for good reason. It’s a long and narrow hole with the fairway sloping towards the rough on each side. Even with a good drive in prime position down the right side, most players will be hitting a long iron, hybrid or fairway wood into the green. 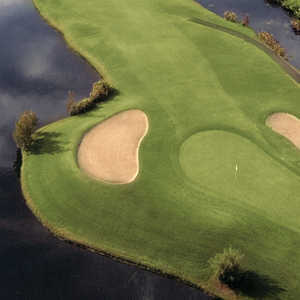 The green is long and narrow and is guarded in front by a large grass bunker which requires you to carry the ball onto the putting surface, eliminating the possibility for the senior-friendly bump and run. Also, the green is relatively flat, which may help you gain a stroke; or at least not give any more away! Par is an outstanding score here. Favorite Par 3: Number 17, Cat Tails, 162 yards (Tee II). Number 17 is all about accuracy. Water guards the entire right side of the green as does a bunker on the left. The green is very deep, so hitting the right club off the tee, be sure to take into account the pin position. It could be the difference between a birdie or a three-putt. Favorite Par 4: Number 18, Black Rush, 405 yards (Tee II). Much like Number 18 on the Hurricane Course, this is one of the most memorable finishing holes in the area. For all but long ball hitters, the water in the landing area shouldn’t come into play, but it’s still advantageous to play down the left side. A good drive will leave a mid to long iron into a green guarded by bunkers and a grass collection area on the left and more sand and a water hazard on the right. Another hole where par could win a prize! Favorite Par 5: Number 16, 548 yards (Tee II). This 3rd par 5 on the inward nine is the longest hole on the course, but don’t let the length fool you. The landing area off the tee between the water on the left and sand on the right is rather generous. Keeping it in the fairway on your layup on the right side is no bargain either, with out of bounds lurking near the trees. Find one of the bunkers on the left side and you will be facing about a 100-yard bunker shot into the green. A well struck approach shot that avoids the bunkers on the left side and finds the green will go a long way in writing down a low number. Any golfer would be ecstatic over the opportunity to play either of these top-rated courses at The Nest. The Gator Course is an exceptional treat, especially if you like to “air it out”; the 3 par five holes on the back nine let you do just that. Length off the tee goes along way on these holes but only the par 3, number 17 is a forced carry over water. There are no extraordinary long forced carries out here however, playing from the yardage that best suits your game will go a long way in making for an enjoyable round of golf. No need to beat yourself up on the golf course; there is too much beauty to be seen as you meander along the cart paths. During our round, we saw ospreys, gators and a bobcat! My favorite part of the course is the putting greens. These new greens roll true and fast with very subtle undulations. Reading the greens can be a little tricky at times, but once you become a member, it will become second nature. The bunkers around the greens are in immaculate condition – well-groomed and quite playable. Par 3’s are fair in length and there is a good chance that you will use every club in your bag on the par fours alone. These days, a private golf club cannot rest on the laurels of the course alone. The Nest has a very active and engaging membership; some of the most social people I have ever met. 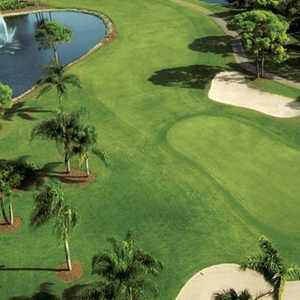 It’s a family-friendly atmosphere that keeps things lively with a number of events, many centered around golf. There are also themed nights in the restaurant such as Pasta Night every Wednesday, a Seafood Buffet every Friday and Prime Rib Night every other Thursday. The dining is incredible and Chef Cameron Hord and his culinary staff serve up some unique yet tasty dishes such as Wonton Pork Belly Tacos and a French Onion Grilled Cheese sandwich. For dinner try the Seafood Louis salad or the Chicken Mariana. These unique dishes will amaze you.